Holocaust survivor and Virginia Holocaust Museum co-founder Jay Ipson spoke to a packed house Monday at Germanna Community College's Fredericksburg Campus in Spotsylvania as part of a GCC History Department event. Holocaust survivor Jay Ipson speaks at Germanna's Sealy Auditorium on Monday. Germanna Assistant Professor of History Katie Eskridge arranged to have Ipson speak. 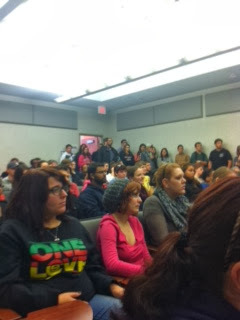 He stayed for an hour after his formal talk, answering students' questions. He was raised in Lithuania, placed in a concentration camp at age 6 in 1941 and escaped with his parents in 1943. He arrived in Richmond with his parents in 1947, when he was 12. Ipson has been appointed by Gov. McDonnell to his Virginia Israel Advisory Board. He has been a board member of the Anti-Defamation League. 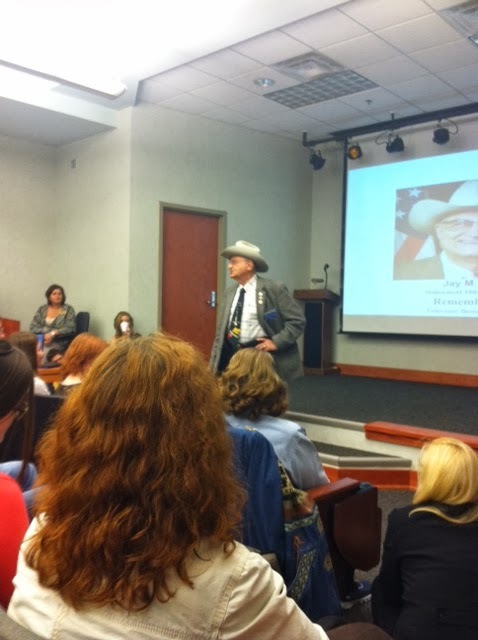 Jay Ipson speak during a history department event. Judi Bartlett, Germanna Community College's Stafford County Center Coordinator, has been elected president of the Virginia Community College Association for 2014-2015. Bartlett was previously an Associate Dean of Instruction at Germanna. She also teaches Web design and other technical courses at GCC. She has 15 years experience in higher education. Prior to that, she was a technology analyst for the federal government, where she helped the General Services Administration prepare for the year 2000 rollover problem, also known as Y2K and the Millennium Bug. Bartlett has mentored students in Germanna's Great Expectations program, which helps young people who are aging out of the foster care system complete high school, gain access to a community college education and make the transition to living independently. She has served on Germanna's faculty senate as a non-voting member and is a member of the college's Threat Assessment Committee. When shots rang out at Dealey Plaza on Nov. 22, 1963, Jack McNairy was a Dallas high-school student who watched as President John F. Kennedy’s motorcade sped away. A Secret Service agent asked the 18-year-old McNairy to give him a ride to Parkland Memorial Hospital. Once there, McNairy stared in disbelief into the president’s blood-splattered limo moments before the Secret Service ordered it cleaned and sent it back to Washington. McNairy interviews played a key part in the Discovery Channel's 2008 investigative program, "Inside theTarget Car." 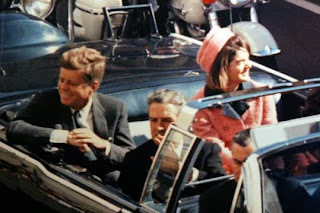 What McNairy saw seems to support the Lee Harvey Oswald as lone gunman theory reinforced by Larry Sabato in his new book "The Kennedy Half-Century: The Presidency, Assassination, and Lasting Legacy of John F. Kennedy." Jim Martin was a young newspaperman covering President Kennedy’s assassination from a Washington perspective. Germanna Community College history instructor Dan Carter will moderate a discussion with McNairy and Martin and GCC Asst. Prof. Stuart Smith will explain the political climate that led to the president making his fateful trip to Dallas. A discussion with the audience will follow. The event, which is open to public, free of charge, will be held at Sealy Auditorium in the Workforce Building at Germanna’s Fredericksburg Area Campus in Spotsylvania from 11 a.m. to 12:30 p.m. on Nov. 5, 2013. An interactive video feed in room 114 at Germanna’s Locust Grove Campus and room 118 at GCC's Daniel Technology Center will allow student and area residents in those locations to watch and hear the event live and ask the panelists questions. Germanna Community College moved a step closer to a permanent center in Stafford County last night when the county's Board of Supervisors approved development and land needed for the project. Stafford, the county with the largest population in Germanna’s service area, is a logical place for GCC to grow, he said. The permanent center would be another in a series of steps in raising Germanna’s profile in Stafford to meet community needs, beginning with the Stafford County Center (which has exceeded its 1,000 student capacity) in August 2009 and the GCC Automotive Center in August 2012. When a permanent center opened, the college would close those facilities, which are rented, and consolidate at the permanent site southeast of the intersection of U.S. 1 and Hospital Center Boulevard. 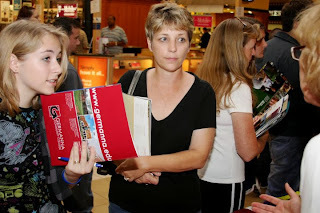 Don't miss the 2013 College Tour Wednesday from 9 a.m.-11 a.m. at the Locust Grove Campus and noon to 2 p.m. at the Fredericksburg Campus in Spotsylvania and at Spotsylvania Towne Center from 6:30 p.m. to 8:30 p.m.
Germanna Community College Engineering Prof. Davyda Hammond and Germanna Middle College Program Administrative Assistant Shavanta Hayes were honored with Virginia Community Colleges Association Showcase Awards Oct. 4 at the 31st Annual Conference at the Virginia Beach/Norfolk Hotel and Conference Center. “Since her arrival in August of 2011, Davyda Hammond has revitalized the Engineering program at Germanna. She brings practical engineering experiences into her classroom, including frequent use of a 3-D printer to build student designs, and a visit by a local engineering firm to help the students create concrete samples and test their strength. “In addition to expanding learning opportunities in her lab, she introduces her students to the world beyond their campus. As the founding sponsor of the Applied Engineering Club, she took a student team to the American Society of Mechanical Engineers Student Professional Development Conference at the University of Virginia, where they competed against junior and senior students from five university engineering programs, and placed in all of the competitions. She also led students in competing in CANstruction, a combination engineering challenge and service project in which students collected canned food for the local food bank and used it to create structural art. “Dr. Hammond’s leadership extends beyond the lab and classroom. She has created a second track for the Germanna Community College engineering program to include electrical as well as mechanical engineering." "…Dr. Hammond is interested in providing practical learning experiences and research opportunities for Germanna engineering students. She is also interested in increasing the involvement of underrepresented groups in STEM careers." She received the 2013 Outstanding Faculty Advisor Award for her work with the Germanna Applied Engineering Student Club. 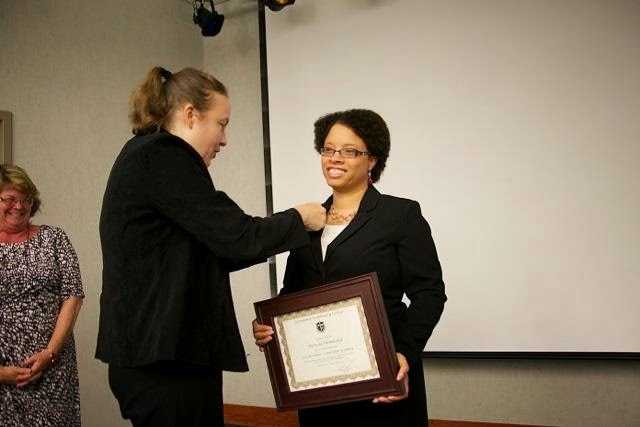 She is also a graduate of the Germanna’s President’s Leadership Academy, a year-long program designed to develop rising leaders and she attended the Chair Academy in April 2013. In addition to her teaching duties, Dr. Hammond continues to conduct research focused on the health impacts of urban air pollution. Her most recent publication, “Cardiovascular impacts and micro-environmental exposure factors associated with continuous personal PM2.5 monitoring”, is under review by the Journal of Exposure Science and Environmental Epidemiology. Dr. Hammond has a Ph.D. in Environmental Health Engineering from the University of Alabama at Birmingham, an M.S. in Mechanical Engineering from the University of California, Irvine and a B.S.in Mechanical Engineering from Auburn University. She is a member of the American Society of Mechanical Engineers, the International Society of Exposure Science, and the American Public Health Association. SHAVANTA HAYES received a Staff Showcase Award. She is pursuing an associate’s degree in Business Administration at Germanna. "Ms. Hayes graduated from GCC’s Middle College Program in 2008 while working full time in retail. Upon completion of Middle College, ,she continued to work full time and pursue an associate’s degree in business. “In 2010, she applied for the Middle College Administrative Assistant position and was unanimously chosen because of her passion for the program. “Even though her position as administrative assistant is in itself a full-time job, she serves as a mentor, advisor, role model, and advocate for Middle College students and is able to inspire them in ways that no other staff member can because she has been where they are. She encourages them to strive to be the best that they can be. She sets a shining example to all who are willing to push themselves and strive for a better life." Upon her graduation from Germanna in May of 2014, Ms. Hayes plans to transfer to Hampton University to pursue her bachelor’s and master’s degrees in business administration. She has served on Germanna’s Black History Month Committee and Commencement Committee. She has been a recipient of the Doris Buffett Sunshine Lady Scholarship for two years and of the Ray and Joyce Zachmann Scholarship. The latest Germanna Today cable TV episode hosted by GCC President David A. Sam and Prof. Ashley Anglin features a tribute to the late Dean of Nursing Mary Gilkey and a look at the college's Virtual Hospital. 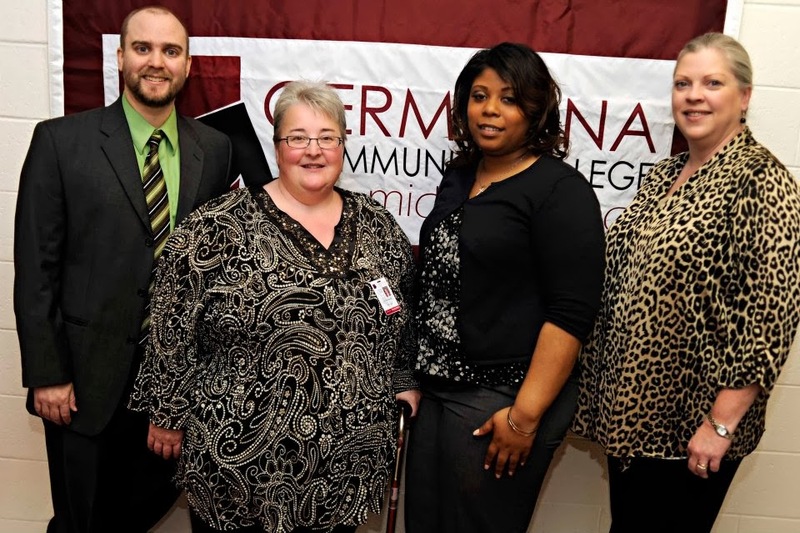 Germanna Community College will deploy printing kiosks at its campuses and centers, providing students with convenient access while generating less waste. Students will be able to print what they need, when they need it and where they need it. Printing charges will be eight cents per page for black and white and 40 cents per page for color. Beginning January 2014, students will have $2 loaded to their accounts each semester, providing 25 free pages of printing. Students may load additional funds to their accounts as needed. Watch for location information and additional details in the coming weeks. Lisa Marsh spent seven years styling hair, a job she loved. But after hurting her back, she knew she needed to find another career. After graduating from Germanna Community College with a degree in business management, she turned to Germanna's Adult Career Coach Program for help. Michelle Beverage, a career coach, and Marie Hawley, career counselor, helped her with resumes and interviewing and supported her each step of the way. “The program was an amazing experience for me,” Lisa said. The Adult Career Coach Program is a grant-funded free program that guides adult displaced workers through determining what career switch may be appropriate and how to navigate that path. Lisa believed her journey was eased by having people at Germanna she could call on. “Michelle gathered all my information and put it in a database. She helped me with interviewing skills, and she gave me advice on the "dress" for interviewing. Anytime I had an interview, I emailed her, and there was a pep talk coming right back to me,” said Lisa. Changing careers can be overwhelming. Michelle helps with decisions about credit and noncredit courses, certification, and even financial aid. She helps folks access the Virginia Wizard, which can guide someone toward his interests and strengths. 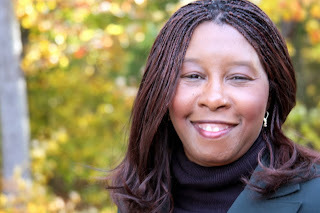 She can also connect people to Cheri Ober, the experiential learning coordinator at Germanna. Cheri helps people on the credit side who want to do an internship. Her office is located at the Virginia Workforce Center in Spotsylvania County, also called the One-Stop. As people walk through the door, they can visit the Virginia Employment Commission and see Michelle at the same time for help with free services. Lisa was one of those who benefited. “Lisa was very motivated. She followed up on everything she was supposed to do. From the beginning, she was on top of her game,” Michelle said. The Adult Career Coach Program can help remove barriers, help people figure out which direction to take, and nudge them along in the process of finding a new job. Germanna offers courses and certificates in health care, industry and construction, and technology among others. As a career coach, Michelle helps people get back on their feet. Lisa is now working at Germanna in the financial aid office. “I can't say enough about Michelle. She never led me down the wrong path. She worked very hard to help me. She's an amazing woman, very good at what she does,” said Lisa. All services funded by a U.S. Department of Labor ETA grant award. This is the creation of the grantee and does not necessarily reflect the official position of the USDOL. Holocaust survivor and Virginia Holocaust Museum cofounder Jay Ipson will speak in Sealy Auditorium at Germanna’s Fredericksburg Area Campus in Spotsylvania at 11 a.m. on Oct. 22. Admission is free and open to the public. Prof. Bradshaw said new research by the United States Holocaust Museum estimates that 15-20 million died or were imprisoned in the Nazi ghetto and camp system. “Mr. Ipson's story of survival is something I believe everyone should hear,” she said. Ipson was co-founder of the Virginia Holocaust Museum. 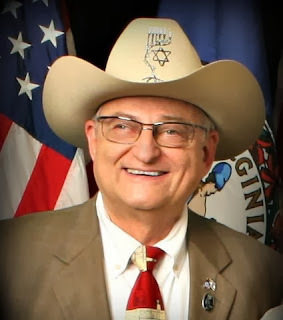 He has been a board member of the Anti-Defamation League, chairman of the Automotive Engineers Virginia Section, and Chairman of the Curriculum Committee of the Virginia Vocational Center. Germanna’s Fredericksburg Area Campus is located off U.S. 17 near Cosner’s Corner in Massaponax. For more information, email kbradshaw@germanna.edu. To observe the 50th anniversary of President John F. Kennedy’s assassination, Germanna Community College will host "Standing Next to History," a panel discussion featuring an eyewitness who was at Dealey Plaza at the time of the shooting and at Parkland Memorial Hospital moments after the presidential limousine arrived there. The event will be held in Sealy Auditorium at Germanna’s Fredericksburg Area Campus in Spotsylvania from 11 a.m. to 12:30 p.m. on Nov. 5, 2013. Admission is free and it’s open to the public. When shots rang out at Dealey Plaza on Nov. 22, 1963, Jack McNairy was a Dallas high-school student who watched as President John F. Kennedy’s motorcade sped away. A Secret Service agent who had been left behind asked the 16-year-old McNairy to give him a ride Parkland Memorial Hospital. Once there, McNairy stared in disbelief into the president’s blood-splattered limo before the Secret Service ordered it cleaned and sent it back to Washington. Another member of the panel will be Jim Martin, who was a young newspaperman covering President Kennedy’s assassination from a Washington perspective. Germanna history instructor Dan Carter will moderate the discussion with McNairy and Martin and GCC Assistant Professor of History Stuart H. Smith III will explain the political climate that led to the president making his fateful trip to Dallas. Audience questions will follow. McNairy's Discovery Channel interview begins at the 8 minute mark in the video below.